This photograph of the church and graveyard at Carraigin on the eastern shore of Lough Corrib was taken near the village of Headford in August 2008. It shows the remains of a medieval church and graveyard which were built within the boundaries of an earlier ecclesiastical enclosure. It is not know when exactly the original church was built but it was recorded as being in ruins by 1641. Many of the upright tombstones which can be seen in the photograph date from the early 19th century although the graveyard was reopened in the 1960s and is still in use today. Not much is know about the previous circular ecclesiastical enclosure on which the medieval church was built. All that survives today is the arc of a collapsed grassed-over stony bank. There is also a children's burial ground with the ruins of the church. 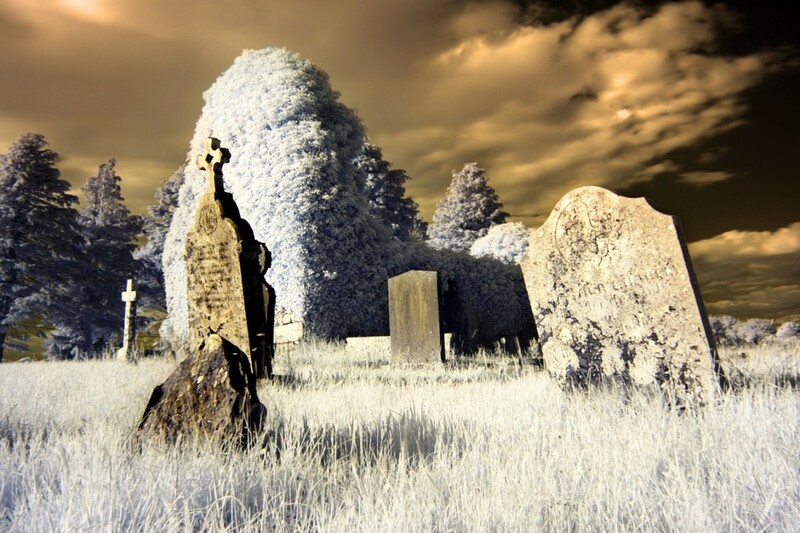 Children's burial grounds, know in Irish as a Cilliní, are found all across Ireland. They were in use from medieval times right up until the early 1900s. They were generally used for burying still born or unbaptised children as these children were not permitted to be buried on consecrated church grounds. They were also sometimes used to bury strangers to the area or suicide victims. Children's burial grounds are mainly found in an area which is set apart from other burials, frequently to the north of the regular graveyard. Often the locations chosen for these children's burial grounds were abandoned early Christian church sites, but children were also buried in such places as ringforts, boundary walls, under lone bushes or outside a graveyard wall. Unusually, in the case of Carrigan, the children's burial ground is located within the walls of the ruined church, although it is thought that the it dates from sometime after the abandonment of the church which happened sometime before the 17th century. It is also likely that it extents beyond the internal walls of the ruined church. Carrigan Castle is a 13th century tower house built 500m west of Carrigan church and graveyard. It is know that it was in the possession of a William Gaynard in 1574. It was bunt down by the by IRA in the civil war in 1922 but was fully restored in 1970. According to local folklore there is a souterrain or underground tunnel which led from the graveyard to the caste. However no trace of this has been found to date.